A schematic diagram of a triode is shown in Fig. B6.2. The third electrode between the cathode and the anode consists of a wire grid which hardly affects the motion of the electrons from the cathode to the anode when there is no voltage on it. However, a small positive voltage on the grid gives great encouragement to the flow of electrons. The current from cathode to anode increases significantly. A negative voltage applied to the grid discourages the flow of electrons, i.e. the current decreases. Why is this an amplifier? 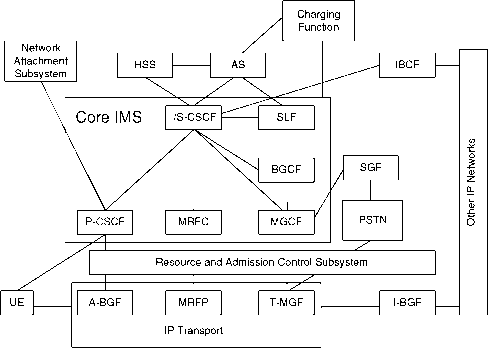 To explain that, we need to draw the circuit of Fig. B6.2(b). It consists of three batteries, a triode and a resistance. Fig. B6.1 (a) An alternating voltage applied to a resonant circuit. (b) The current as a function of frequency. It has a maximum at the resonant frequency, f.
Fig. B6.2 (a) A schematic diagram of a triode tube. (b) An amplifying circuit containing a triode valve. (c) Anode current versus grid voltage characteristics of the circuit. characteristic curve as C. As the voltage between the cathode and grid becomes less negative, the anode current first rises slowly and then quite steeply. For the operation of the triode, a particular point on this characteristic may be chosen, determined by the batteries shown. In Fig. B6.2(c) this point is B. If now a small sinusoidal input voltage is applied between the cathode and the grid, it will cause a large change in the anode current. This varying anode current flows across the resistor and produces a large varying voltage across it. The voltage across the resistor, the output voltage, may be 10 000 times larger than the voltage on the grid. This is what is called amplification. The triode in the circuit of Fig. B6.2(b) is an amplifier. Is it possible to produce an amplifier which will only amplify a narrow frequency band? It is. For that we need to replace the resistance in the amplifier by a resonant circuit which this time has to be the parallel connection of a capacitor and an inductor, as shown in Fig. B6.3 (the small resistance in series with the inductor is there because coils are wound of wires, which must have a certain amount of resistance). Fig. 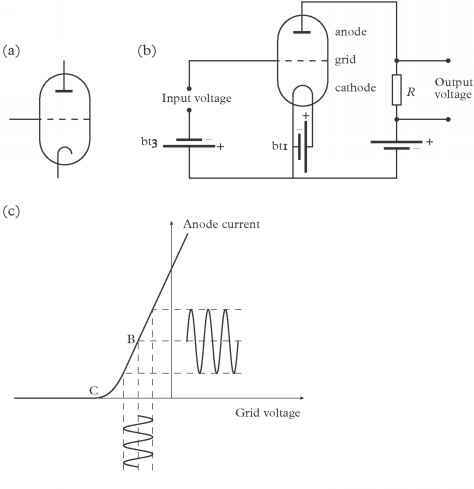 B6.3 Replacing the resistance in the anode circuit by a resonant circuit, the amplification occurs only in the vicinity of the resonant frequency. An amplifier can be turned into an oscillator by feeding back part of the output to the input. The theory behind this is quite sophisticated but the main principle can be appreciated by giving a simple example. Let us assume that we have a voltage amplifier that amplifies by a factor of too. If 1 per cent of this output is fed back to the input then we now have 1V at the input. But the 1V will be amplified to become 100 V at the output. If 1 per cent of that output is fed back continuously to the input then this process can go on indefinitely, i.e. there is always an output without the need for an input. And that is an oscillator. What will be the frequency of this oscillator? How would the oscillator know at which frequency to oscillate? If the amplifier has a resonant circuit in it then it will have an amplification of too only at the resonant frequency. Hence the only frequency that can be generated by the feedback is that particular resonant frequency. The birth of electronics completely changed the future potential of communications. It provided three vital components, a detector, an amplifier and an oscillator. With those components it became eventually possible to communicate from any point on earth to any other point, whether with or without wires. But, of course, electronics did more than that. Its use led to better measurement and control techniques in all industries which, in turn, accelerated the progress of science. To the claim that the Second Industrial Revolution started with the triple interaction between physics, engineering and mathematics, the further claim can now be added that its further progress was contingent on the advent of electronics. Without electronics the Second Industrial Revolution would have ground to a halt. With electronics in its advance guard it became unstoppable. What is the principle of triode? What is the working principle of triode? What is the operation principle of triode?